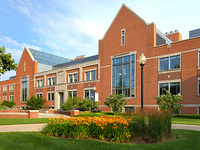 I joined the Department of Chemistry at Hope College in Holland, Michigan, in the summer of 1988. My professional interests are in chemistry research and science teaching. A common theme in my work has been to try and join these two interests together. In other words, I have tried to work on projects where teaching is research and research is teaching. While at Hope I have worked with over 40 undergraduate students in chemistry research. Our early work on main group metal alkoxide and thiolate complexes has led to a better understanding of the solid-state structure and solution behavior of low-valent tin and lead alkoxide complexes. We have also investigated applications of these complexes to organic synthesis. More specifically, we used chiral diols to make chiral metal alkoxides that can be used in asymmetric synthesis. The goal of asymmetric synthesis is to make molecules with only one "handedness." Because handedness affects biological activity, asymmetric synthesis is of great importance to drug development in the pharmaceutical industry. The undergraduate students I work with are introduced to all facets of the research enterprise, and this teaching part of doing research is very important to me. Currently, the Stewart group is interested in the question of how students develop their abilities to address real, complex, science-rich problems. Many important societal issues such as climate change are deeply rooted in science or technology. It is important that students, as our future leaders, understand the science behind these problems. But more importantly, students must develop an understanding of the production and nature of scientific knowledge (how do we know what we know?) so they can be critical consumers of emerging science knowledge. Science and technology are changing so rapidly that students must be equipped to understand and evaluate new science claims. One approach to these questions in the Stewart group involves the development and testing of case studies that address important science questions. The case studies are interdisciplinary and investigative. Investigative means that the students participating in the case study must develop their own research question to pursue. In other words, they "make" new science knowledge, and thus in a hands-on fashion, learn something about the production of science knowledge. Dr. Stewart is interested in working with students from any science, mathematics or psychology major interested in questions about how students learn. You do not have to be an education major, but this work is particularly well-suited for students interested in K–12 or college teaching. The development of these case studies is part of a larger Howard Hughes Medical Institute (HHMI) program at Hope College.